I want to ask a pre-sale question. Am I able to map a company logo? That is, I want to create a form and each company have have an individual logo. Is there a way to allow for a logo to be uploaded and will be mapped to the pdf document? Yes. 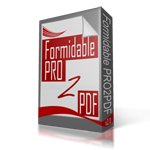 PRO2PDF can merge an uploaded image using Formidable’s File Upload Field and/or an image from a URL with Formidable’s Website/URL field.